Preeeeeetty crazy. So... Let's catch up! Beyond this, I've finally decided to get an Instagram for my "Dr. Ben Fung" brand. With that checked off and this blog continuing... I'm still in the works to getting to two or three... or four posts I owe myself in my Daddy In The Raw #DadBlogger. OH! We saw MOANA. It was an incredible movie... wait.... probably better for Daddy In The Raw. So, okay... back on track. I'm coming to grips with the fact that, I just have too many outlets. I think this will have to be a space for personal reflection, journaling, and generally, a quarterly'ish update. Life has gotten cray cray! There are more platforms and more mediums than I can begin to fully appreciate... despite being some type of social media guru in the space of physical therapy. I expect there to be a consolidation of user behaviors.... after all, people want to feel connected. 2017 will have a convergence of technologies and user demands. 2017 will also be an insane year for millennial entrepreneurs. Next year, I expect people to crave the personal touch that is very much retro, right now. I also expect the coming year to feel like an extension of 2016... simply because of some of the socio-economic dynamics which are holding on to their inertia. Finally, I anticipate that the year 2017 will be considered one of the biggest years of finding unity, dispite disagreements... as well as finding growth in emerging opportunities previously considered a dead-end. Such benefits will come to those who are willing to look beyond their own likes, preferences, and penchants; to those who are willing to become more than they are, for causes greater than & more meaningful than themselves. I guess that's it. See you around New Years! It was an amazing production. The students, faculty, and everyone involved should be IMMENSELY proud. It was polished. It was professional. It FELT like a legit conference put on by event planners and media producers. Again, my deepest thanks for being able to contribute to the event. 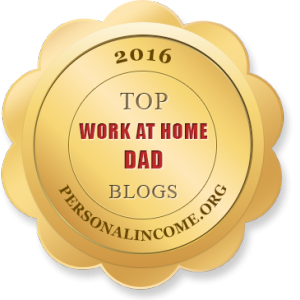 So, I had the surprising pleasure of being contacted regarding the inclusion of my blog to be listed as a "Top Work At Home Dad Blog!" It's kinda cool, since it seems they found out about all this via this direct blog I've been running for years. Either way, it's nice to know people are on the lookout for this phenomenon & I'm glad to be included in such a collection; if anything, in hopes it can inspire and empower others to take that plunge into being at home with those who matter most in life. So, a week ago, I got stuck in an elevator during a family vacation / reunion. It came completely unexpected. While the hotel was getting some work done downstairs, there was no evidence it would affect the elevators per se. In fact, the moment I got into the elevator, there was a lady who came out all cheery as could be with a plate of food. I went in after she came out, hit the button from floor 3 to 1, for the lobby. I felt the elevator go down. Then, it stopped. And... the door didn't open. I hit the open door button... the closed door button. Nothing. I thought, "Huh... maybe it's a glitch?" So, I hit for floor 2 and figured if the door opens, I'll just take the stairs down and let the front desk know. The firefighters came and rescued me. They thanked me for being cool and not yelling them. Apparently, there are some pretty thankless folks out there who rake anyone they can find over the coals... even their own rescuers... for mishaps, regardless of fault or blame. Weird. Well... all that was fun and done. NOW, I need to deal with this water damage leak thing coming from the unit above me.... *sighs*... Such is life. #HappyFathersDay. Result: Good company. Good people. Gotta love Twitter! About a year ago, I stated my thoughts "A Case For The Primary Care Physiotherapist." Just recently, I had two dental care experiences which were vastly different from each other. While there's much to say -- and -- I *will* say, regarding the customer experience factor... there is far more significant discussion available regarding integrating a primary care PT element into healthcare. And, even some cursory discussion regarding a PT insurance much as medical, dental, vision, etc... so, why not "physical?" After all... who is REALLY doing the "physical" examinations? Any way... without further ado... here is my vlog on...! As always, thank you for being with me! I'm eager to hear your thoughts. Be sure to tweet me @DrBenFung or feel free to leave a comment below or in the YouTube video itself! 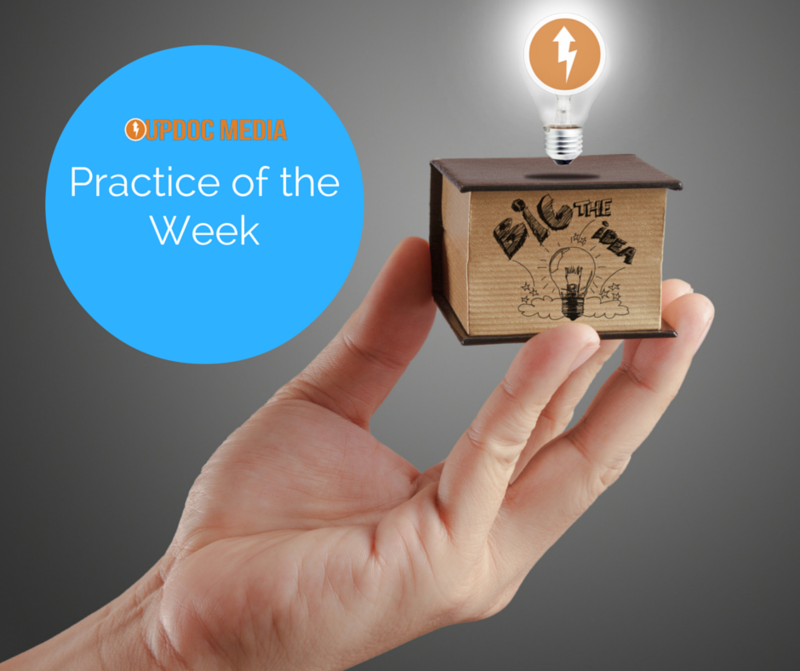 My classic post, "Future Thoughts for Private Practice PT." And, even Part 1 - Part 2 - and, Part 3 of, 2015 Version of Future Thoughts. Annnnnd...my 2016 Prediction at UpDoc Media! So, some of you know that I was diagnosed with ADD (when it was still called that) as a youngster. Over the years, I've figured out a way to channel all that energy. I don't think it's anything except a super power at this point. Once you can properly engage & channel minds on this far side of the attention-continuum-curve, it's basically like channeling the power of the sun. I did a video blog on this via my Dad Blog called "Daddy In The Raw: The Real Life of a Work At Home Dad." It's linked below. I hope you enjoy it and that it helps! Following a Periscope by Dr. Jeff Moore on balance and entrepreneurialism, I went to thinking about how I'm achieving balance. I realized for years, I had it wrong. I was balancing life as one balances things on a plate. Hence, the sayings like, "My plate is full." However, I think that a new way of looking at balance is vertically. Originally, I sad like the leaning tower of Pisa. A better way of seeing it, is like the game Jenga. Here's my video blab on achieving work-life-balance by doing it vertically. There will be at least 30 of your colleagues & their families, romping around at the Happiest Place On Earth! LOL. Who are we kidding? Of course I'm trying to get you to go! I probably don't even need to say it, you probably already know: I'm a Disney FIEND. I love all things Disney & Star Wars; therefore, Disneyland (and Disney California Adventure) is just plain awesome. 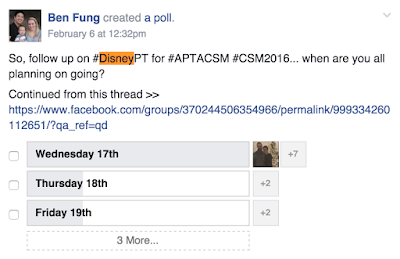 The fact that CSM is but and only next door to the Disneyland Resort, I can only hope that more and more of you will be helping me do a #DisneyPT TAKEOVER! Considering that most of the CSM activities will be ceasing around 5 or 6pm -- AND -- that Disneyland is open until midnight for both the Friday & Saturday... there should be plenty of opportunities to get into the parks. The Disneyland Resort is undergoing all sorts of changes in preparation for Star Wars land. What this means is that the train will be down and much of that same area surrounding the transition between Frontierland and Fantasyland. The good news is that because there is a bit less to do there, you don't have to feel paralyzed by too many options and trying to fit everything in. You'll have your option of park hoppers and various ticket prices to reflect how many days you wish to get in. 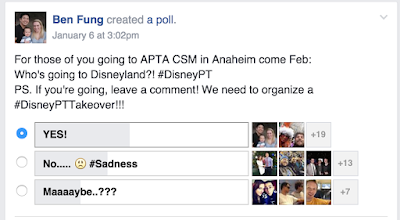 If anything, I'm hoping to organize an unofficial PT takeover... but, more news on that later. If you haven't been to Disneyland in the last couple years... or decade. This is what you stand to gain! Tommorrowland is entirely Star Wars'd out. The whole place is now undergoing something called the Season of the Force. The whole area has Star Wars music, decor, and Star Tours is now a 4-D experience along with a special scene which ties in the new Star Wars movie, The Force Awakens! The Paint The Night Parade is perhaps Disneyland's best parade ever! Not only did it debut for Disneyland's 60th anniversary; it gave the proper nods to the old Electrical Parade which is now available in Disney World, Orlando. Oh, right! 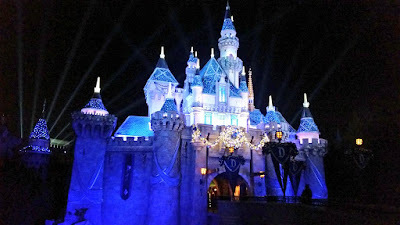 It's Disneyland's Diamond Anniversary! Many of the "fun" rollercoasters have been upgraded. This includes the Matterhorn Bobsled as well as Frontierland's Big Thunder Mountain. I went on Big Thunder just last week and the upgrades are incredible! Disneyland allows for FastPasses for you to spend in the park while your pass, waits in line and allows for a return time for you to cut the majority of most lines. If you have children, you can also use what is called a Rider Switch Pass where one of you waits through the line and the other gets to do something else. Then, you switch the passes and take 3 guests with you to cut the majority of the line. A similar effect goes for wheelchair access. There are a LOT more new shows including Mickey and the Magical Map, a brand new World of Color show in Disney California Adventure. Oh! And, if you aren't familiar with Disney California Adventure... it's the "adult" park. There, you will find great food, great rides (actual rollercoasters and what not), and great booze. That's right ALCOHOL. Space Mountain is now Hyperspace Mountain, re-themed with projections of Star Wars effects to really accelerate the ride experience. Many of the dark rides in Fantasyland have been upgraded in one fashion or another. An example is Alice in Wonderland and the new dynamic projections they have as you go through the ride itself. So, finally, I must ask... if you're not planning on going yet... are you now?! Physical Therapists tend to go to their daily jobs as workers. And, yet, there is all this complaint about being undervalued, under appreciated, being at the bottom of the totem pole, etc. Ironically, this attitude is actually the root of the problem. If you "work for," you will always care less. If you "take ownership," then you will always care more. And, we need people to care more. You either love it or hate. If you're like me, you probably went into PT school thinking about outpatient ortho and/or sports, waiting that magical 5 years until you're good enough, and then opening up your own business. Well, as life would have it, I would rotate through various settings and some how found the acute care hospital to be my love and passion as it pertains to the raw potential to which PTs can learn -- and -- to which PTs can contribute. Best application of knowledge base. Highest level of clinical diversity. Yep, I did plenty of manual, ortho, and even ED. Highest level of clinical complexity. Where else are you going to get someone who has 20 different medical conditions, blood that should be melting out of their body, vital signs that make no sense, but are agreed by all in the medical team to appropriate for home discharge? INTENSITY. With the most intense medical situations & most intense patient care scenarios. Largest political canvas in healthcare. Acute care requires savvy to navigate and typically 10-15 years to move into a significant space of leadership (system level, VP, c-level, etc. ), 2-5 years for first promotion. 5-10 years for leadership opportunities. Some quick commentary. People get scared of the ICU. Well, the ICU is the safest place. You have the quickest response team right there, more monitoring that you could ever ask for. Rarely, does anything "go wrong" in terms of PT in the ICU. In fact and in my experience, all the accidents, strokes, and crazy events occurred on ortho (DVTs), trauma (complexity, despite medical stability), and medical units (because, the guard is down). Additionally in acute care, you get exposure and opportunities to serve in wound care; be it laser, wound VAC, or MIST... or traditional stuff, sharps, even maggot. You get imaging, coordination with the entire healthcare spectrum of professionals. The opportunity in acute care for PT is immense. The ability to leverage nearly the entire spectrum of our clinical training is wonderful. Sure, you're not going to do mobs on everyone. But, really, is doing mobs all that PT is about? Surely not. Think about acute care. It was the ultimate game changer for me. It remains, to this day, one of the most influential and significant leveraged experiences which affects my clinical practice. If you're a student, get IN a hospital rotation. If you're a new grad, get some per diem hours... you will never regret it.